For that timeless country feel this outfit has it all. Sirri’s gorgeous herringbone tweed looking brown check jacket is complemented by a brown and green windowpane check. The skirt has needlecord patches that match the elbow patches. with brown quilted lining. The ensemble is set off with a gorgeous high neck frill knit blouse and a matching check beret. 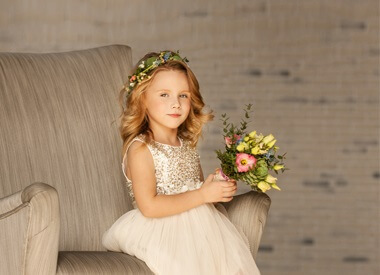 A stunning ensemble for any young miss, evoking a country feel during those cool winter months.